The IBM System Storage 3592 tape drives consist of the following drives; the 3592-E05 (TS1120), the 3592-E06 (TS1130) and the 3592-E07 (TS1140). These drives offer solutions to address applications that need high-capacity, fast access to data or long-term data retention. These drives can be used as stand alone (desktop) solutions with our desktop enclosures or they can be used in a 19” rack mount environment with our 2U dual drive rack enclosures. They are also supported in IBM frames and tape libraries. All IBM 3592 drives are Fiber Channel attached. We sell IBM banded and certified drives. We also sell data media cartridges that are available in three lengths and in either re-writeable or WORM formats. The short length 3592 JJ/JR cartridges provide rapid access to data and the standard length 3592 JA/JW cartridges provide high capacity. The 3592 Extended Data JB and Extended WORM JX 700GB high capacity cartridges support the TS 1130 and 1140 tape drives only. We have IBM brand new and re-certified media. The IBM System Storage™ TS1120 Tape Drive Model 3592-E05 is supported for integration in the IBM TotalStorage ® Tape Libraries, Virtual Tape Servers (VTS), and tape controllers. 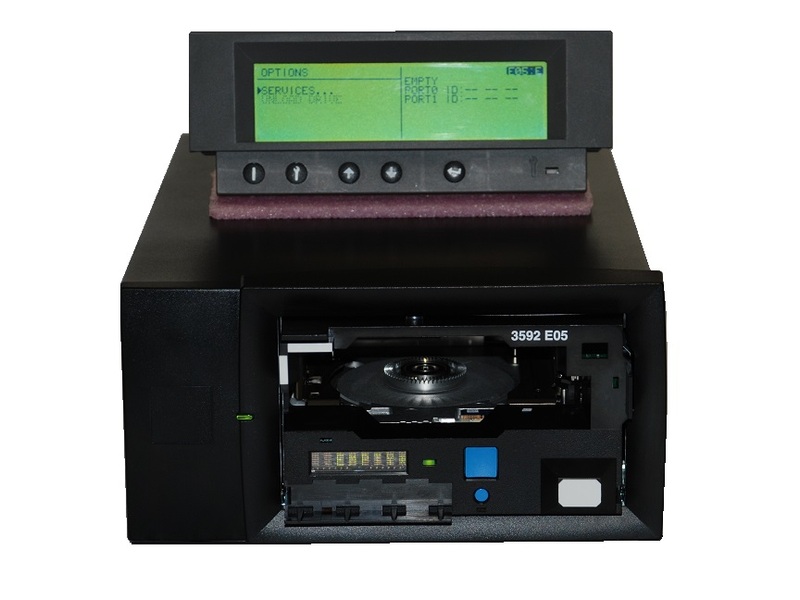 The TS1120 Tape Drive is designed to provide high levels of performance, reliability, and cartridge capacity. The TS1120 E05 Tape Drive can help address the needs of tape customers across a broad range of computing environments. We can place the E05 drive in our desktop enclosure or place two of them side by side in our dual drive 2U rack mount kit. The E05 drive can also be integrated into the 3584 and 3494 IBM TotalStorage libraries. The TS1120 E05 Tape Drive has a dual-port 4-Gbps Fibre Channel interface. It has a high-technology design that increases the native data rate to up to 100 MB/sec.. The TS1120 Model E05 can format a cartridge uncompressed up to 500 GB (1.5 TB with 3:1 compression). The TS1120 E05 is designed for desktop or library automation. This allows it to be used in the IBM TotalStorage 3584 and 3494 Tape Libraries, and StorageTek Automated Cartridge System (ACS) solutions. The IBM System Storage™ TS1130 Tape Drive (TS1130 tape drive) features storage capability to help you establish easy access to data, better security, long-term retention and data governance and regulatory compliance. The TS1130 tape drive offers high-performance flexible data storage with support for data encryption. The TS1130 tape drive can help you protect your investments in tape automation by offering compatibility with existing automation. To further protect your investment, an upgrade model is available for your existing IBM System Storage TS1120 Tape Drives. And to support a heterogeneous server environment, the TS1130 offers multiplatform support. Desktop and Rackmount solutions available. The TS1130 Tape Drive supports IBM System Storage TS3400 and TS3500 Tape Libraries, IBM TotalStorage® 3494 Tape Libraries, racks that enable stand-alone installation. The TS1130 Tape Drive is able to utilize existing IBM 3592 data cartridges at higher levels of capacity and performance. The tape drive uses re-writable or Write Once Read Many (WORM) IBM 3592 cartridges available in three levels of capacity. IBM System i5™, System p5™, System z™ and System x™ Microsoft Windows NT, XP, Windows 8 and Windows Server 2008, Linux , HP-UX and Sun Solaris OS. Data storage requirements rely on high capacity and fast access to data as well as long-term data retention. The IBM TS1140 Tape Drive (TS1140 tape drive) features storage capabilities to help you establish easy, rapid access to data, improve security, provide long-term retention, and help maintain data governance and regulatory compliance. The TS1140 tape drive offers high-performance, with support for data encryption. The drive can help you by offering compatibility with existing automation. The TS1140 Tape Drive protects your investment, this is an upgrade model for your existing TS1130 Tape Drives. The TS1140 tape drive supports the System Storage TS3500 Tape Library and IBM racks that enable stand-alone installation. Small form factor and high capacity. IBM System i5™, System p5™, System z™ and System x™, Microsoft Windows NT, XP and Sun Solaris OS support.